This is the second time out with the Takahashi NJP mount. 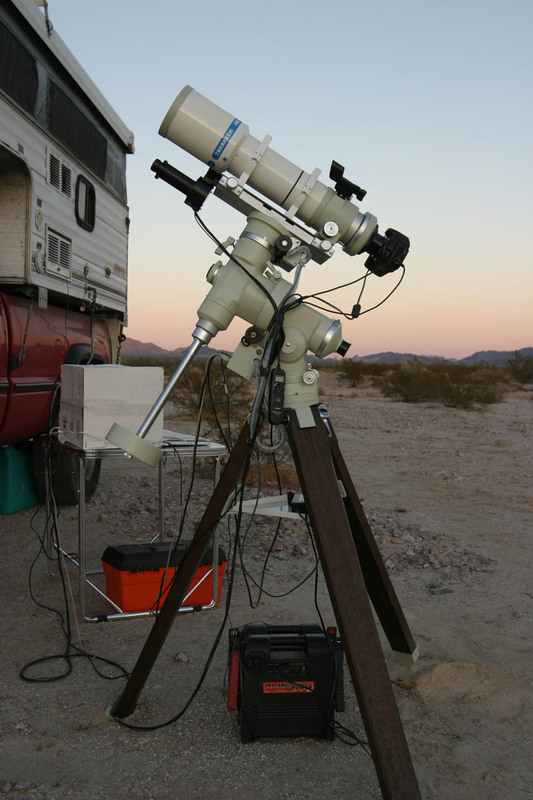 A FSQ-106N scope, 29Da camera, STV with E-finder and a red dot finder that I pulled off from my N4 are attached. If you look close, you'll see a board under one of the tripod legs. After midnight on Friday, guiding went to crap, then tried with no guiding, no joy. Turned in, and when I got up the next day to take the flats, found that the leg had sunk into the sand a bunch, must have been very tired not to notice it the previous night. Good thing that I always carry a small assortment of boards in the truck. Had no problems that night. Taken at Desert Center, Ca.